Now this is more like it! Earlier this week, Square-Enix unveiled their rather restrained (well, for them) take on Iron Man for their Play Arts Kai Variant line, and I lamented the lack of their usual reckless abandon. They're making up for it in the best way though with this ridiculous, wonderful Cowboy Batman. Western Bats is part of a new series of Batman figures in the PAK Variant line called Batman Timeless first teased at NYCC 2014, and re-imagines the Dark Knight across a variety of time periods - including a Spartan Batman, a Medieval Knight Batman, and Steampunk Victorian Batman, because I mean why the hell not really? HIS COWBOY HAT HAS BAT EARS, FOR CHRIST'S SAKE. This is exactly what I want from Play Arts Kai - we've got plenty of 'realistic' takes on characters like Batman and others, and I love that Square-Enix are just kind of free to get licenses and then promptly go ridiculous with them. It's much more exciting to get a line of 'Batman, but X' figures instead of just many variations on his classic look. I hope they branch out the crazy into their other characters as well! 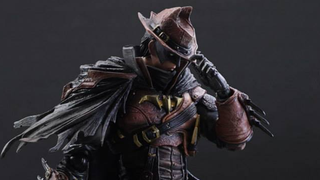 There's no details on a price or release date for Western Batman just yet, but expect him to set you back around 9,000 Yen (that's roughly $70-80).